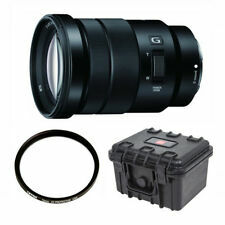 Sony E PZ 18-105mm F4 G OSS Lens SELP18105G for Sony E-Mount. E-mount Mid-range Zoom. Front Lens Cap. Rear Lens Cap. Lens Type Lens Weight Mount Material Our warranty covers labour costs for repairing the faulty unit. 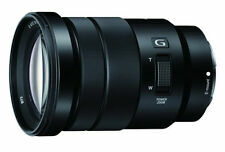 Sony G SELP18105G E PZ 18-105mm f/4 G OSS. Sony E SEL50F18 E 1.8/50 OSS. 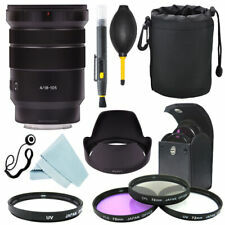 For sale are two Sony lenses. 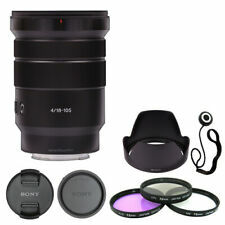 Sony E PZ 18-105mm F4 G OSS Lens SELP18105G for Sony E-Mount. Handycam Zoom Performance. Sony E-Mount. Front Lens Cap. Rear Lens Cap. E-mount Mid-range Zoom. Lens Type Lens Weight . A beautiful image with high resolution and contrast is obtained over the entire zoom range. The power is also demonstrated for movie shooting. The zoom lever is adopted on the side of the lens. The zoom lever is that of the Handycam. 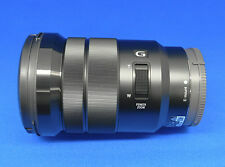 Sony G-Series 18-105mm f/4 PZ Aspherical. IF OSS G ED Lens for E-mount. Canada, South East Asia and Asia. USA, Canada. Constant F4 maximum aperture. Sony SKU: SELP18105G | Helix SKU: SYSELP18105G. The length of the lens remains constant while zooming or focusing. Zoom reversing is available after software update. Sony E-mount. · 35 mm equivalent focal length: 27-157.5 mm. ◆ G lens for the first lens for E mount. ※ E mount lens (for Sony mirrorless one eye). E-mount lens for the first G lens. 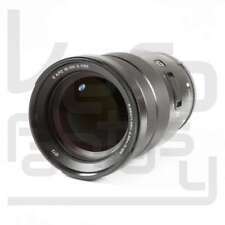 E-mount lens (for Sony mirrorless single-lens). Sony (SONY). Great service. Write to us. We accept only unopened item. United States. be careful. (Aperture Range F4 - 22. Minimum Aperture (F) 22. All technical specifications are taken from the original manufacturer's manual or website. 1) Speaker have sound. Convenience / Service. Trust and Safety. MPN : SELP18105G. Series : Sony G-Series. Lens Aperture : f/4G. 100% Authentic! Middle East Free! Focal Length Type : Zoom.